It was the first weekend in October and several families from our neighborhood went camping at Inks Lake. 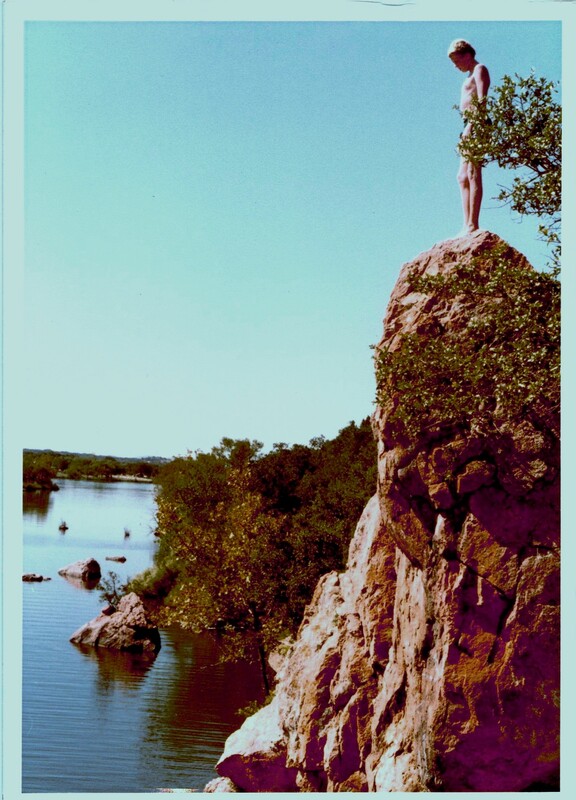 Close by were some bluffs that we could jump off and across the lake was Camp Longhorn. We decided to swim across the lake on some blow up rafts and go off the multi-colored waterslide. The camp was closed which made it all the more fun. I think we had made it down the slide once or twice when Tex Robertson came out to greet us. I am sure we anticipated getting yelled at and kicked off the property, but Tex understood what was going on and kindly greeted us and let us on the slide before sending us back across the lake. I never attended Camp Longhorn or can say that I knew Tex Robertson, but reflecting on the brief encounter with him I know now we share a kindred spirit. 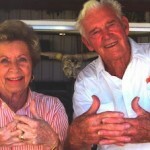 Tex was born in 1909 in Sweetwater Texas. He attended the University of Michigan where he was a swimmer and won a bronze medal in the 1932 Olympic Games as a member of the Water Polo Team. The International Swimming Hall of Fame credits Tex with the invention of the flip turn as he coached Adolf Kiefer to the gold medal in the 1936 Olympics. In 1935 Tex founded the University of Texas swimming team where he coached until 1950. 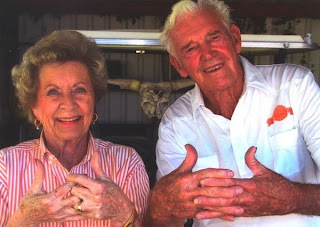 Tex and his wife Pat started Camp Longhorn in 1939 as a summer camp that has been a rich part of childhood memories of thousands of Texans and has left a legacy of great stories and fun adventures. During a weekend trip to Canyon Lake I met Brian who was a swimmer and former counselor at Camp Longhorn. We began sharing memories from the camps we attended. I remember being the first humans to test out the new camp waterslide at Kanakuk Kamp and thinking there was no way the insurance company ever knew of us crawling on our bellies and swimming through caverns deep in caves of Arkansas. I learned that following the war Tex purchased some fuel storage bunkers that he planned to use for tents or tarps. Some of the counselors got the idea to blow them up and launch each other into the lake by jumping from a tower onto the balloon. Commonly known as the “Blob”, this has become a staple at camps across the country. According to my new friend, Brian, there was a reunion of old Camp Longhorn families and staff before Tex passed away and so many of the crazy stories were shared. While reflecting on all the harrowing adventures, the exhilaration and great fun that was had it was a wonder no one died or got seriously hurt. At that moment Tex told my friend Brian. “Brian, Fun is Dangerous”. It is too bad that insurance companies and lawyers have taken away so much of the danger that made life fun. 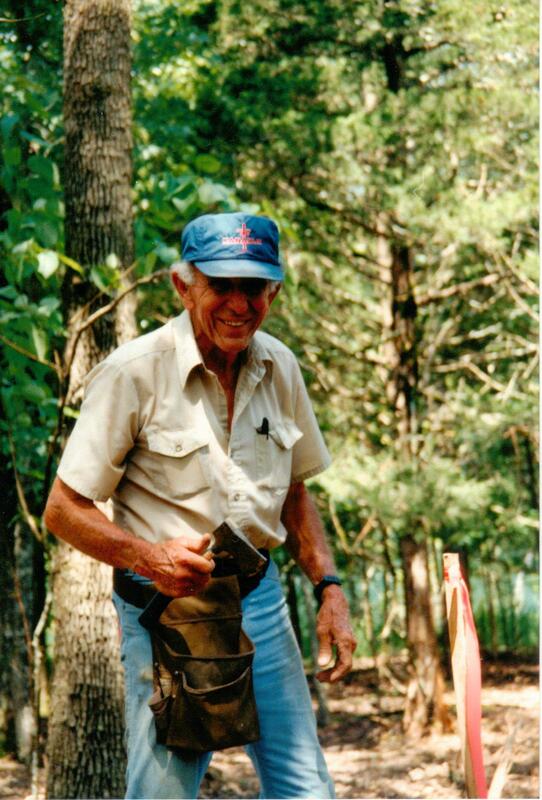 I had many opportunities to see the vision and work with Spike White, founder of Kanakuk Kamps and appreciated the man that he was and the spirit of adventure and fun that we shared. I wish I had the opportunity to know Tex Robertson, but know the legacy that he has left has shaped a couple of generations of men for the better. May we never forget the men who invested in our lives and became our heros and may we carry on this legacy to the next generation. God has blessed us with men like Tex Robertson and Spike White. 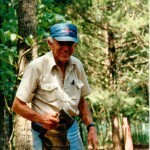 This entry was posted in Camp Applegate, Rites of Passage and tagged Camp Longhorn, Kankakuk Kamps, Spike White, Tex Robertson. Bookmark the permalink.